Welcome to the 2014 football season and our first edition of The Pick List. Each Thursday throughout the regular season, The Pick List will feature six of the best match-ups across the state, and make our predictions on a handful of other games. This is exactly what Sunflower League athletic directors and coaches had in mind when they voted to allow open scheduling in week one of the season. The thought was to allow Sunflower League teams to play a variety of competition including teams in the western part of the state and even feature games with schools from across state lines. Among the first of these matchups pits Garden City making the long trip to Olathe to take on the East Hawks. The game features two programs coming off of strong seasons, but with some questions to be answered early in the season. Garden City finished 2013 with an 8-4 record and advanced to the 6A state semifinals before falling to eventual state champion Derby, 55-17. The Buffs return six starters on offense and two on defense, but most glaringly they must find an answer at quarterback where Kpreps 6A All-State selection Greyson Tempel has moved on to Pitt State. All Tempel did at Garden City was pass for more than 4,000 yards and rush for nearly 2,300 yards for his career while scoring a combined 69 touchdowns. Whoever attempts to fill Tempel’s shoes will have a promising target in 6A all-state receiver Caleb Tramp (6-5, 210). Tramp made 55 catches for 1,102 yards and 12 touchdowns in 2013. Olathe East has been a model of consistency under Jeff Meyers despite never being able to hang a state football banner from the rafters. The Hawks have gone 160-68 in Meyers 23 seasons, including 85-27 over the past ten seasons. Olathe East has reached the playoffs 13 consecutive season and advance to at least the state quarterfinals in each of the last four years. This season, Olathe East will rely on senior running back Jalen Branson (5-11, 185). Branson rushed for more than 850 yards and 10 touchdowns a season ago, and will be one of the fastest backs in the state. He’ll look to run behind Brycen Hinson (6-5, 300) on his way to a big season for the Hawks. A pair of top five teams will meet to kick off the Ark Valley Chisholm Trail League schedule as defending 6A champion Derby travels to Maize. Both the Panthers and Eagles are ranked fourth in their respective classification in the Kpreps Top 5 Rankings to begin the season. Derby was the preseason favorite to win the 6A championship in 2013, but a home loss to Salina South in week one convinced many in the state that the Panthers maybe were not untouchable. Derby’s talent took over from there; however, as the Panthers rolled off 12 consecutive victories culminating in a 28-21 victory over Shawnee Mission East to win the Class 6A title. That early season win propelled Salina South to the top of the Class 5A rankings where they were then upset by Maize in week two. That set up a showdown between Maize and Derby in week three that turned out to be much closer on paper than on the field. Maize’s opening drive ended when Connor Lungwitz was intercepted by Derby’s Shane Fowler near the end zone, and the Panthers never looked back. Derby would score on its first six possessions in routing the Eagles, 62-13. A year later, Maize has some key pieces returning from a 7-3 season that ended in a heartbreaking five overtime loss to Manhattan in the first round. The Eagles believe the move to Class 5A may help them make a deep playoff run. Senior signal-caller Connor Lungwitz (6-5, 205) threw for nearly 2,000 yards last season with 28 touchdowns. His primary receiving target returns in Kendall Stewart who tallied 750 yards receiving last year. The Eagles will have to replace dynamic running back Chase White, who rushed for more than 1,650 yards. But the main question will be the offensive line, with only Konner Swenson returning. Graduation also hit Derby hard. The Panthers returns only two defensive starters in defensive end Chase Branstetter and linebacker Dan Connor. However, transfers Darreon Jackson, a safety from Mesquite, Texas, and running back Curtis Whitten from Wichita Heights have reason to believe all is not lost. Jackson has experience at wide receiver and Whitten will join the speedy Garrett Xanders in the backfield and give the Derby offense a chance to be explosive once again. The Buhler Crusaders take the field for the first time as defending 4A champions with a tough road test at Andale. The Crusaders captured the 4A crown last fall with a 31-14 win over Coffeyville. Gone from that team is 4A all-state running back Riley Allen who rushed for more than 4,000 yards and 58 touchdowns in his career. Buhler returns just eight total starters from last year’s title team, but the cupboard is not empty for Steve Warner. Junior quarterback Jace Williams (6-4, 205) returns and will continue to gain recruiting interest as he gains experience. Williams is also a good safety on the other side of the ball. Helping Williams on offense will be the return of senior tight end Chase Shantz (6-2, 200). Shantz was a first-team all-Ark Valley Chisholm Trail League selection a year ago, and can play multiple positions on offense. Buhler also returns offensive linemen Jaden Abernathy (6-2, 265) and Davey Dukart (6-0, 210). For much of the 2013 season, Andale had its sights set on the 4A state title. The Indians were highly ranked for much of the season, but fell 24-14 at Holton in the state quarterfinals. Buhler would knock off Holton the following week propelling the Crusaders to the title game in Salina. Expectations could not be higher in 2014 for Andale. As part of the newly formed 4A-II, the Indians begin the season ranked No. 1, thanks to 12 returning starters. Among those returnees is all-4A selection Hunter Knoblauch (5-11, 180). Knoblauch rushed for 1,750 yards and 24 touchdowns a season ago, and will be joined in a loaded backfield by Anthony Capul (5-9, 200) and Hank Eck (5-11, 180). Luke Walstad will replace three-year starter Jared Smarsh at quarterback and should be able to provide more diversity to the Indian offense. Andale won the 2013 meeting between the two teams, 28-21. Holton, the No. 2 ranked team in Class 4A Division II, will open the season against defending Class 3A state champion and top-ranked Silver Lake. The teams are two of the most traditional programs in the state. The Holton Wildcats graduated 23 seniors from last year’s 12-1 team that fell 28-14 in the semifinals to eventual 4A state champion Buhler. Brooks Barta, who enters his 19th season as Holton’s head coach, returns only two starters on offense and four on defense. Senior offensive lineman Cooper Allen and junior fullback Mason Barta lead the offense, while linebacker Barta and defensive backs Luis Butto, Trey Tanking and Justin Rieschick provide experience on defense. Barta has directed Holton to a 184-30 record and 4A state championships in 2003, 2005 and 2012. This is the first season of the 32-team 4A Division II. Silver Lake graduated many of its starters from an explosive offense, including All-State quarterback Dailin Kruger. The Eagles, who have reached the 3A state championship game in 11 of the past 12 seasons, return four starters on offense and eight on defense. Ryan Matzke, who started three games at quarterback last year for an injured Kruger, will take over under center. He will have Jace Freeman, who caught 56 passes for 1,100 yards and 14 touchdowns, as a top receiving target. Cody Renfro and Zach Boyd are back as the top ball carriers. C.J. Hamilton enters his 40 season as the Eagles’ head coach. He has directed Silver Lake to a 370-85 record and eight state titles. La Crosse carries a 36-game regular-season winning streak, the longest current run in Kansas. The Leopards went 12-1 and finished as Class 2-1A state runner-up for the second time in three years last fall. La Crosse lost 61-0 to Centralia in the championship, the biggest margin of victory in state finale history. The Leopards bring back senior quarterback Jack Garcia, senior end/fullback Sheldon Schmidt, and senior all-purpose threat Andrew Jay, arguably the best trio in 2-1A. Garcia and Schmidt enter their third seasons as starters. Schmidt played in just four games last season because of a knee injury, but his production and athleticism produced a scholarship offer from Nebraska-Kearney this summer and strong interest from other programs, including Kansas State. Schmidt will play fullback for the first time in 2014, while Jay is expected to play tailback and see time in the slot, at wideout and return game. Jay led the state in return yards last fall and started at wide receiver. Olpe went 7-4 in 2013 after an 8-3 season in 2012. The Eagles graduated three all-state players, but return linebacker Joe Redeker, an all-state player two years ago who was hurt last season. The Eagles bring back seven starters on offense and eight on defense. Senior quarterback Bo Krueger ran for 1,175 yards, passed for 1,000 and accounted for 26 TDs. Olpe started 0-2 last fall with losses to Sedgwick (57-35) and Wellsville (12-0) but eventually reached the second round of the playoffs before a 36-0 loss to Centralia. This game will be at Bethel College in Newton, roughly halfway for both teams. The neutral site helped this game onto the slate at the statewide scheduling meeting last fall. La Crosse, the lone 11-man school in the Central Prairie League, is used to the nomadic schedule with several neutral site contests in recent years, including the state games and regular season contests with KC Christ Prep and Sedan. La Crosse’s talented trio and strong supporting cast will be enough for the victory. Osborne encountered tragedy in late summer when coach Steve Tiernan suffered a motorcycle crash and is still in recovery. Last year, Tiernan led Osborne to a 13-0 season and Eight-Man, Division I crown. The Bulldogs set the eight-man state record for points and Tiernan’s son, Jake, set the individual and team records for completion percentage. Assistant coach Cullen Riner, the previous coach, has taken over again as head coach. Riner first engineered the Osborne turnaround when the Bulldogs made the switch to eight-man football. Osborne has won double-digit games in three of the four seasons in eight-man. Assistant coach Ken Ubelaker was going to retire, but came back out to coach after Tiernan’s crash. Jake Tiernan and senior Brandt Wolters lead a team that graduated all-state talents Maverick Lerock and Kenton Ubelaker, but added fullback Richard Zeiters, who led a 5-4 Logan-Palco team in rushing last fall. Thunder Ridge went 7-2 and lost in the first round to Wallace County last season after a state title in 2011 and a runner-up in 2012. 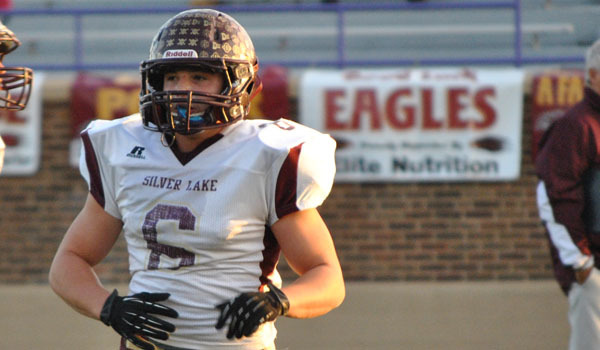 The Longhorns feature a massive line and speedy senior running back Trent Rietzke. The Longhorns’ line includes four returning starters between 193 and 253 pounds. Wolters is Osborne’s biggest returning starter at 200 pounds. Osborne has plenty of talent, but graduated its top line and will significantly smaller than the Longhorns. Plus, Thunder Ridge has been outstanding across the board – but especially at home in recent years. Thunder Ridge’s size, ability to control the game with Rietzke and one home loss since 2010 will prove the difference in an outstanding matchup.